DV8 continues the Creed line of upper-mid performance balls with the DV8 Creed Rebellion. The Creed Rebellion combines the Composite Claw Solid coverstock with the Creed low RG asymmetric core. This core and cover pairing create a ball that produces a strong hook with flip on medium to heavy oil conditions. If you were a fan of the original Creed and the Creed Revelation, you will not be disappointed in the new DV8 Creed Rebellion. This ball is best for heavy oil and is incredibly predictable. This asymmetrical core ball can be thrown from multiple angles. The Creed Rebellion will provide you more mid-lane roll and stronger finish down the lane. 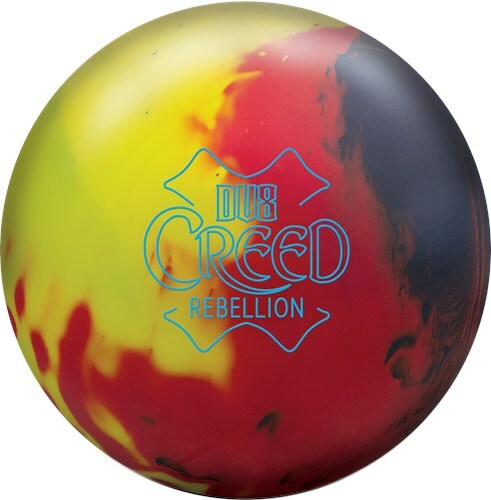 The Creed Rebellion’s ball motion is still very, very smooth and very predictable down the lane like all of the balls in the Creed line, with more mid-lane ball motion. Again, the layout for this ball is pin down and my CG at my midline of my span and its motion its ball motion is simply incredible. The DV8 Creed Rebellion is a different look for a heavier oil ball. It gives the the classic long and strong look many league bowlers like for heavier volumes of oil. In my opinion this is a great example of cover/core matchup. The Creed core with its low rg really revs up early but the cover is clean enough that is doesnt burn way too early even with my rev rate. Alot of times the Pitbulls are simply too much cover and core for me, this is what makes this ball special imo. It really gives me the best of both worlds especially on heavier volume THS. The Rebellion will be a tick below the Pitbulls and above the Hitman Revenge and Poison in terms of overall strength. It will also be a great big ball choice for bowlers with lower speeds and rev dominance. Overall thoughts for me, this is just a fun ball to throw, it allows me to get in my wheelhouse and just send it right. Even though its strong, its clean enough to stay with it and chase the oil right opening up your angles. Add a Creed Rebellion to your bag, you won't be disappointed.